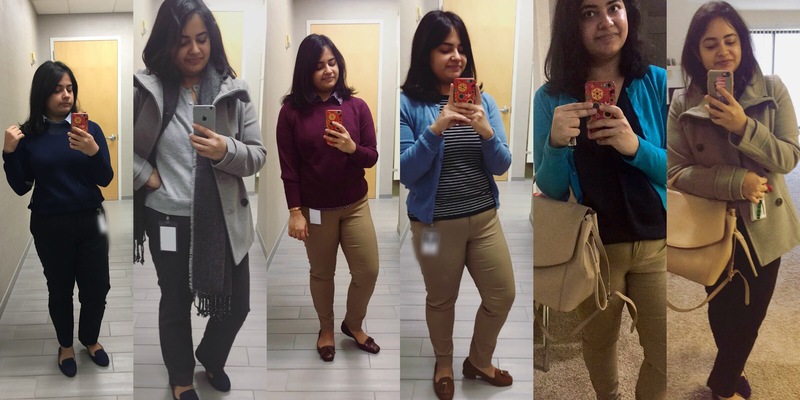 So some days back I shared my favorite work outfits for you all by putting together photos of items online. You can see those here. Today I have a compilation of some of my own work outfits. Those who don’t know I’m an engineer and work in a corporate office so my work clothes are mostly semi formal. Not too casual to wear jeans or tshirts. To be honest I loveee wearing formals and I always wanted a workplace where I get to wear some kind of formals daily haha. But I know many of you are not that fond of them and so I’m here to share some of my outfits to get some inspiration to style your work outfits !! I go really early in the mornings and it’s hard to get someone to click pictures ! So we’ll make do with these pictures today and I promise you guys I’ll be back soon with a proper formals look book for you all ! I’ll list down details of the outfits below. Outfit 1 – collared sweater from h&m. It’s a sweater but has attached collar to look like you have a shirt underneath it. Black trousers from The Limited. As you can see from my outfits, I highly recommend H&M and Limited for affordable work outfits. Also, Zara. They have a lot of variety, somethings can be motonous but then it comes down to how you style it so keep expirementing and have fun !! Take care guys :* love you all! Next > Zara city bag | What’s in my bag?